A Rottweiler is most definitely protective by nature, of both family and property. A lot of people confuse a dog being protective, with a dog being aggressive. The two things are just not the same. 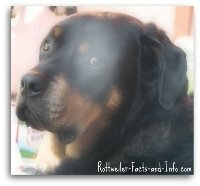 Aggression in NOT a Rottie trait - in fact, aggression is not any dog breed's trait. There are usually reasons behind this behavior, and it’s not difficult to correct, but it does take training. 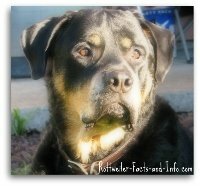 A dog that growls and snarls at you when you get too close to his food bowl while he’s eating, is displaying aggressive behavior..
On the other hand, when your Rottweiler growl’s or barks at a stranger walking towards your house, he’s displaying this unique Rottweiler trait and protecting his property and family, not being aggressive - there's a big difference! This strong Rottweiler trait is why it’s essential to socialize your Rottweiler! One of the best stories I can think of that illustrates this trait best, comes from a neighbor of mine. One of my neighbors lost his 2 dogs in a divorce, not too long after we rescued Chevy. He would see me walking and having training sessions, so one day he stopped by to compliment Chevy and ask me questions about Rottweiler dogs. About a month later, he decided to buy a puppy from a reputable breeder that I had suggested. He brought his new puppy, Cody, over to the house several times to meet Chevy and get some training tips and insight from me. Cody and I got know each other pretty well. A few months later, I noticed my neighbor’s truck at a store in town, and saw Cody sitting in the front passenger seat. The window was a 1/4 or so down, so I walked over and said Hi to Cody. He let me know, under no uncertain terms, that I was a little too close to his truck. The protective instinct Rottweiler trait is why training and socializing your dog is absolutely mandatory. A Rottweiler is not a dog that you can stick out in the back yard, and just expect them to do everything right. If you are not acting as the leader, and teaching her the proper way to behave, she will take matters into her own paw’s, and you will probably not like her rules. If you train and socialize properly, your dog will learn very quickly how to read your body language and emotions. This will help her determine if someone is friend or foe, and how to act accordingly. In other words, she needs to learn that just because someone has bad intentions, or you don’t like them for some reason, does not mean that she can attack them. However, she will guard you – with her life if necessary! One final note on this – Obviously, the size, look, and even the unfortunate reputation of a Rottweiler is an extreme deterrent. A Rott does not need to be made mean, like some irresponsible people think. If you treat him with respect and love, and train him to behave properly, anyone with bad intentions won’t come near you with a 10-foot pole. This, I know from experience! 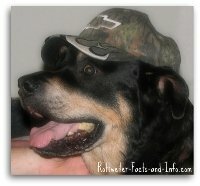 Loyalty is one of the more unique Rottweiler traits, which is why throughout their history, they have served as guard dog’s, and are well known as the Butcher’s dog. Butcher’s, after taking their livestock to market would tie the money bag around the dog’s neck. The butcher’s could count on their Rottweiler to protect both them and the money, on the trek home. I use the word extreme above because I have never known another breed of dog that is so into his people! You really won’t find a Rottie that likes to wander, as their world totally revolves around their family (you). Although un-neutered males will have the urge to seek out the ladies, so this simple procedure is a must. A story comes to mind of when my husband and I were carpooling to work together. We got home and our front door was wide open. There was Savannah (our female Rottie) lying just inside the door with her paws hanging over the door jam. It appeared that she had only stepped out the door to grab the stick that I had made her leave outside the night before. She had of course, chewed the stick into a million pieces on the carpet – But, she never left. The better relationship you build with your Rott, the stronger you’ll see this trait come out. You and your family are the center of her universe. This strong sense of loyalty is what also drives their intensely strong drive to protect their family and property, as well as the unfortunate development of separation anxiety. Those are just a few reasons why training your Rottweiler and spending a sufficient amount of time with him is absolutely essential! They are extremely smart dogs, and you have to treat them with both respect and leadership. Because of their intelligent, willing to work, and eager to please attributes, Rottweiler’s are very easy to train. Although I don’t recommend trying to train with bruit force, as it can become a battle of wills, and trust me when I tell you that they can be awfully stubborn. Being easy to train is one of the most desirable of the Rottweiler traits, and they respond awesome to positive reward training – the reward can be either praise or food. Since they are also known to be gluttons, I can personally confirm that food really motivates them to learn. I have a number of pages on this site that are dedicated to Rottweiler training, and I’ll say again that training is mandatory for a Rottie. A perfect example of training without realizing it comes from girl Savannah. I started to notice that when I jumped up and started yelling at the umpires on the T.V., she would also jump up and start barking at the T.V. with me. It actually got to where I could barley whisper that phrase, and she would go bananas. I’m not sure I could have taught her that on purpose. Rottie’s inherently have high prey drive, and it also stems from their early history. It’s a trait that comes very naturally to most dogs, but especially the working dog breeds. Having a high prey drive, which is one of the least desirable Rottweiler traits just means that they like to chase things – as in taking down prey for dinner. Things they like to chase are usually smaller than them, like cats, squirrels, children, or anything that moves quickly, such as cars. The reason I say "least desirable" is because it can take a lot of training to teach your dog that he can't chase anything and everything he wants to. Did I mention how important it is to train your Rottweiler? In the past, this trait was sometimes desirable – especially in the working dog. But in today’s society, where dogs are mainly household pets – not so much. It’s actually pretty easy to train your Rottweiler puppy to curb her desire to chase. But, if they were never taught when they were young, it really becomes ingrained in them as an older dog, and takes a lot of work to teach them that it’s not ok chase cats and cars. I’ll say it again – training your Rottweiler is not optional, and the sooner you start, the better. . . . . Here's a couple of examples of this trait and why training is important – one positive, one negative. . . . .
. . . . . When Savannah was around 6 months old, she went down to the barn with me to feed the horses. On the way back it started to rain, so I started sprinting. She ran after me, grabbed me by the heel of my foot, and took me down! It was actually really funny, but it made me realize that I had to be careful to teach her that it wasn’t ok to do that, especially because she only weighed about 40 or 50 pounds then. Full grown, she weighed around 120. We exposed her to everything we could think of and taught her to not chase them. She actually loved to play with kids, because they would run and tumble and wrestle with her. She learned early on to not play too rough. Chevy, our Rottweiler rescue on the other hand, was never taught how to sit on command, much less to not chase things. The day my husband brought him home, he tried to jump out the drivers side window of the truck, because of a passing car. The first 6 months we had him, we encountered some pretty scary illustrations of this trait. Basically, if it moved, he wanted to chase it! It took me a good year of hard work to help him learn that he couldn’t chase anything he wanted to. To this day, I still have to be very careful in certain situations, or avoid them all together – like having him the same vicinity as a cat. Please, please, please – Train Your Rottweiler!